Today we are featuring some fun stenciling done by Chris Inanc of NY. Chris does not paint professionally, but enjoys doing projects around her home, for family and friends. This room was created for one of Chris’s daughters. 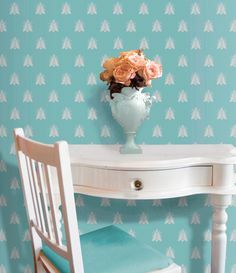 The trellis and vine designs are from Jan Dressler Stencils. Here is a close up of the Swallows Chris stenciled on the cloud ceiling. This design is by Lynn Brehm, of Natural Accents. In her son’s room, Chris did some stripes and decided to add some “lacing”. She created her own 2 part stencil comprised of “dots and x’s”. This macaw, jungle trunk, and vine, from Jan Dressler’s stencil line, were done in Chris’s Master Bedroom. Great job, Chris! OMG Chris ,… I knew you did beautiful work ,but this is absolutley fabulous ! Your work is a “work of art” . By the way ,..it’s absolutely * Sorry for the typo , but I was soooooo excited with your work Chris . I still think it’s magnificent !! I must get to your house to see what else you have done .